In 2015/16, 325.8 million public transport journeys were made in the West Midlands Metropolitan Area (267.1 million bus passenger journeys, 53.7 million rail passenger journeys and 5.0 million metro passenger journeys). Bus: 96% of bus service kilometres in the West Midlands are operated on a commercial basis by 7 private operators. National Express West Midlands (NXWM) operate 79% of the bus mileage in the West Midlands. NXWM is a wholly owned subsidiary of National Express Group. Diamond Bus is the second largest operator, operating 7.3% of all bus mileage. Rail: Govia operate the majority of local rail services in the West Midlands under a franchise with Centro and Department for Transport. The franchise took effect on 11th November 2007, under Govia’s “London Midland” branding. Tram: Midland Metro Line One has been operating since 1999. Altram, a consortium of Ansaldo Trasporti, Laing and NXWM, operate Line One under a 23-year concession let by Centro. The Altram team has been responsible for the construction, design and operation of Midland Metro Line One. 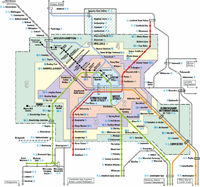 West Midlands Travel Limited (trading as Midland Metro) is a wholly owned subsidiary of National Express Group plc formed to operate and maintain the Light Rail System.